Hard times did not diminish a passion for learning. And, as always, upheaval stimulated questions. Plague in Europe in the 1300s caused people to question divine purpose, the nature of God and society. During these times the Franciscans defended their anti-scholastic view that knowledge of God can come only through revelation and that the divine cannot be known through logic or reason. One of the more creative of such Franciscans was William of Ockham, who studied and taught at Oxford University. Similar to Aquinas, William of Ockhamfocused on the importance of specifics over Plato's abstractions. And, unlike Aquinas, Ockham doubted that one could build from Aristotle's deductive logic to knowledge of the first cause of anything. He rejected abstractions hanging on to nothing concrete. There was no fatherhood, he said, without fathers. He stated that what could be expressed in fewer words was expressed "in vain with more" – which came to be known as Ockham's razor. In other words in problem solving he believed in language that was succinct. Where there is no certainty the fewer the assumptions the better. In scholastic circles Ockham 's point of view gained wide popularity. But he was at odds with Pope John XXII, Ockham siding with those Franciscans that the Church condemned as heretics for holding onto the doctrine of poverty associated with the apostles. The Inquisition was hunting down Franciscans, and Ockham fled to the court of the Holy Roman Emperor, Louis IV, at Munich, in Bavaria. 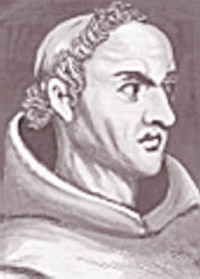 The Pope dismissed Ockham from the Franciscan order in 1331. And Ockham died in Bavaria in 1347, a victim perhaps of the plague while he was trying to reconcile with the Church. After Ockham 's death, the intellectual movement he had founded grew. But while pursuing philosophical questions, intellectuals still lacked interest in experimentation and quantification. They kept to the common belief that everything in nature operates in accord with the Divine Spirit. But their emphasis on the specific over the general was setting the stage for the scientific revolution. This would combine their belief in specifics with scholasticism's belief in reason.